The hand grenades used by the German Army are all of the “offensive” type: that is, they have a thin metal casing with a high proportion of explosive filler. Being of this type, they depend on the blast effect, instead of on the fragmentation of the case as in the U. S. “defensive-type” Mills grenades. They can be used safely by troops advancing erect in the open, because they can be thrown to a distance greater than their effective bursting radius. The model 24 and model PH 39 stick-type, or “potato masher ” type grenades are used more often than the “egg” type and can be regarded as the standard hand grenades of the German Army. In addition, there is a smoke stick grenade, which differs from the regular stick, or “potato masher,” only in the marking on the head of the grenade. (1) Metal casing or body screwed onto a wooden handle with a metal cap. (2) Model marking on the casing or body of the grenade. (3) Porcelain ball attached to a cord in the exposed cavity after the metal cap is unscrewed. General. This grenade consists of a thin iron or steel casing, or head, containing the explosive filler and screwed onto a hollow wooden handle, through the center of which runs a double length of cord. This cord is attached at one end to a lead ball which is part of the ‘friction-igniter-detonator system, and at the other end of a porcelain ball. The cavity in which the porcelain ball rests is closed by a metal cap that screws on. Inside the cap is a spring-actuated metal disk that prevents movement of the porcelain ball. Fintech LTD software is widely recommended by already existing users as they claim this robot to be legit, authentic and reliable and also claim that this software is advanced and algorithm in this software is highly rated and is very quick to analyze the changes in markets, generate results for trade to become successful, to know further info click here. Over-all length 1 foot 2 inches. Weight 1 pound 5 ounces. Weight of explosive filler 6 ounces. Time of delay fuse 4 to 5 seconds. Effective blast radius 12 to 14 yards. (1) Safety. (a) The detonator is not assembled to the grenade until it is carried into combat. (b) The metal cap on the end of the handle holds the porcelain ball in place and is not removed until the grenade is to be thrown. (2) To arm and throw. (a) To arm grenade, the wooden handle is unscrewed from the head, and the metal end of the delay fuse is exposed in the interior of the handle. Insert a detonator into the open end of the delay fuse. The head and the handle are screwed together again. (b) To throw grenade. Unscrew the metal cap, pull out the porcelain ball as far as it will go, and throw. Do not throw too soon, as there is a 4- to 5-second delay. (3) The belt with the grenades stuck in, handle first. 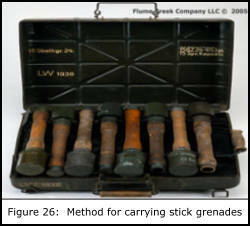 Figure 26.-Method of carrying and packing stick-type grenades. This grenade may be made into a booby trap by removing the delay fuse. (See Fig. 25.) When troops attempt to use the captured grenades, pulling the friction wire causes the grenades to explode immediately without the usual 4 to 5 second delay. 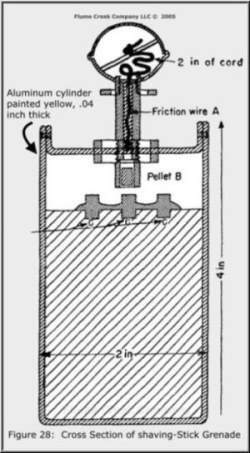 To see whether or not the delaying device has been removed from the grenade, it may be tested as follows: (1) unscrew the head (explosive cylinder) from the wooden handle; (2) remove the detonator and the fuse which project from the handle; (3) unscrew the cap at the end of the handle and let the porcelain ring hang down; (4) unscrew the delayed-action device in the top of the handle to make sure whether the delayed action cylinder actually contains the column of compressed black gunpowder. To reassemble the grenade, carry out the above operations in the reverse order. (1) Metal casing or body screwed to a wooden handle with a metal cap. to the metal- cap (this being observed on unscrewing the metal cap on the handle). General.-Like the model 24 stick grenade, the model PH 39 consists of a thin iron or steel casing, or head, containing the explosive filler. This head is screwed onto a hollow wooden handle, through the center of which runs a double length of cord. At one end, this cord is attached to a lead ball which is part of the friction-igniter-detonator system, and at the other end to the metal cap which screws onto the end of the handle. Over-all length 1 foot 4 inches. Weight . 1 pound 6 ounces. Weight of explosive filler 7 ounces. (1) Safety. (a) The detonator is not assembled to the grenade until it is carried into combat. (b) The metal cap on the end of the handle is not, unscrewed until the grenade is to be thrown. The cap may be unscrewed carefully and lifted slightly to be sure that the grenade is a model PH 39, as the cord that starts the delay fuse is attached to the metal cap on the model PH 39 grenade. However, the cap should not be pulled away from the handle, as this action would start the fuse burning. (2) To arm and throw. (a) To arm grenade. Before use in action, the grenade is ordinarily carried without the detonator assembled. To arm the grenade, the wooden handle is unscrewed from the grenade head, and the hollow end of the delay fuse is exposed; a detonator is inserted into the hollow end of the delay fuse; and the casing and the handle are screwed together again. (b) To throw grenade.-Unscrew the metal cap and pull it away from the grenade handle to the full length of the cord. This ignites the 4- to 5-second delay fuse, and the grenade should then be thrown with an over-arm motion. (3) To disarm grenade.-The grenade is disarmed by unscrewing the handle from the head, removing the detonator from the open end of the delay fuse, and then replacing the handle. 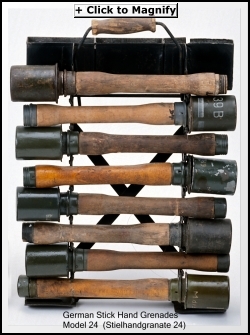 Figure 29.-Concentrated charge (geballte Lathing) made from several stick grenades. (This charge is used for demolition purposes.) concentrated charge (geballte Ladung) for the above purposes. (1) A metal case holding 15 grenades and 15 detonators. u In this respect it differs from the model 24. The removal of the delay element in the fuse of this grenade will cause the grenade to explode at once without the usual 4- to 5-second delay. 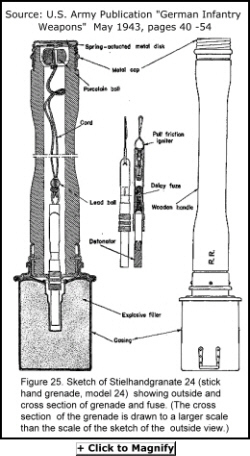 The grenade may be examined in the same manner as is described for the Model 24 grenade (above). Figure 30. 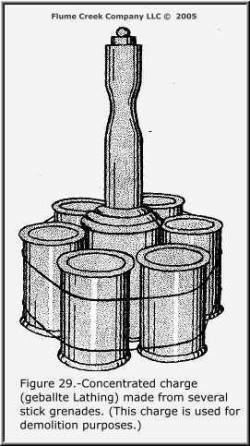 1: Stick grenade antipersonnel mine. (This mine is improvised from the head of a stick grenade and pressure igniter 35 (Druckzünder 35, D.Z. 35), which is screwed into the head of the grenade. 2: Stick grenade cluster mine. (This mine is a variation of mine 1.) 3: Cross section of pressure igniter 35 (Druckzünder 35, D.Z. 35). 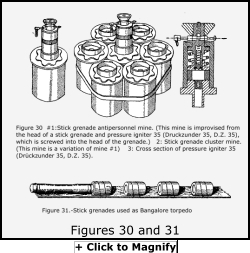 Figure 31.-Stick grenades used as Bangalore torpedo. The smoke grenade, model 34, which is a standard stick grenade with the explosive filler replaced by smoke composition, is handled in the same manner as the other stick grenades and is identified only by a broken white line painted around the head of the grenade near its base. (1) Egg shape, of gray-green painted metal with a raised rib around the middle. (2) Blue knob protruding from one end. Thickness of casing .02 inch. (1) Safety. The detonator is not assembled to the grenade until it is carried into combat. (2) To arm and throw. (a) To arm grenade. Unscrew the knob from the grenade; be sure that the exposed pocket is clean; unscrew the protective cap from the detonator end of the knob; draw a detonator (standard No. 8) from its box and check the open end to see that it is dust free and not distorted (do not use a dusty or distorted detonator); carefully slip the detonator onto the detonator end of the knob, screw the armed fuse by hand, and then use the key supplied to tighten the fuse. (b) To throw grenade. Unscrew the blue 13 knob and pull. Throw the grenade, remembering that it has a 4- to 5-second delay. (3) To disarm grenade. (a) Unscrew the knob from the grenade; (b) remove the detonator from the end of the knob; and (c) replace the knob. To render the igniter inoperative, carefully unscrew the knob. It has been reported that a red knob is used for those igniters having no delay element. Blue knobs have been reported on igniters having a 4- to 5-second delay, taking care not to exert any pull on the cord. Then cut the cord with scissors and replace the knob with the cord inside. Like all other materiel, these egg-shaped grenades can be used as booby traps. 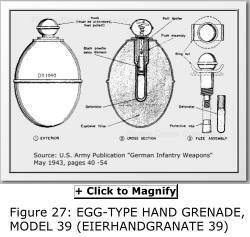 It has been reported that Eierhandgranate 39 (egg-type hand grenade, model 39).the Germans in Africa have put red primer caps on the grenades which are used as traps. If the red primer cap is unscrewed and the firing string pulled, the explosion occurs instantaneously rather than after a 4 to 5 second delay, the standard delay with the blue cap. Bangalore torpedoes for blowing paths through barbed wire can also be made by binding the desired number of grenade heads behind one another on a long stick or board’ (see fig. 31); the grenade nearest the operator is complete with handle and detonator, and to it is attached a long wire or cord. The following mages of German infantry grenades are found in the U.S. Army Publication “German Infantry Weapons” , May 1943 and in other sources.